New stocks has arrived at Toys R Us, the combination models this batch is fabulous. 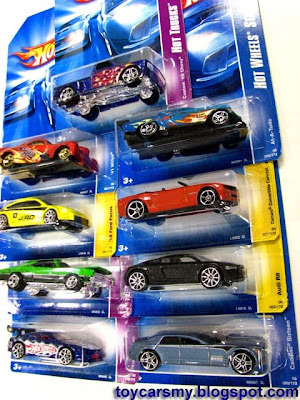 Models in the picture are my collection today, T-Hunt for this wave is '05 Ford Mustang GT. I was there not long after store opened, the cars just hanged without the price tag, but the T-Hunt have disappeared. The store keeper told me the T-Hunts has gone, but It seem I'm the 1st customer for that day, I guess you know who took the T-Hunt. Below models are my pick of the day. I got all in the last HWs wave in Vietnam one month ago. Still confuse about the releasing method between Vietnam and Malaysia?!?! ?